READINGTON, NJ --- It’s a big anniversary and its being celebrated in a big way. The QuickChek New Jersey Festival of Ballooning in Association with PNC Bank celebrates its 35th anniversary with its biggest lineup of special shaped balloons and its biggest live concert series ever when the three-day festival takes off July 28-29-30, 2017 at Solberg Airport in Readington, NJ. Advance tickets offering great savings for the 35th annual QuickChek New Jersey Festival of Ballooning in Association with PNC Bank go on sale at all 149 QuickChek fresh convenience market store locations throughout New Jersey, the Hudson Valley and Long Island beginning Friday, May 26. This year’s edition of the largest summertime hot air balloon and music festival in North America features 100 hot air balloons from around the world including 11 special shaped balloons and a live concert series headed by legendary rocker Pat Benatar. 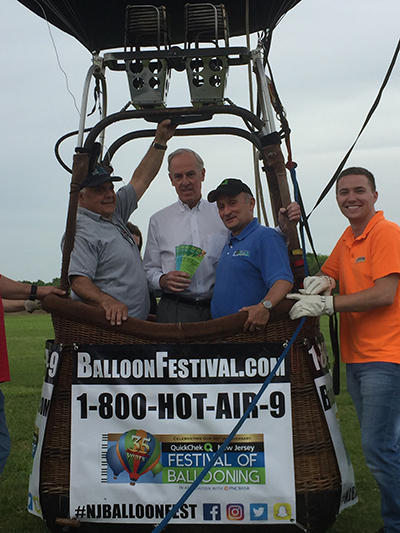 Pictured (L-R) Hot air balloon pilot Tony DiCocco of Brookside Ballooning, QuickChek CEO Dean Durling, Festival Executive Producer Howard Freeman and Festival Director Brent Swanson prepare to launch this year’s advance ticket sale.